Collection of quotes added by Easytee. You will be reminded of your mistakes, but the One who loves you the most is much more interested in your lovely future with Him after this earthly journey. Christmas is another special moment to watch your loved ones smile or laugh sincerely from their hearts. It is one of the best moments you would ever wished to re-live again; because you are a part of this memorable moment. 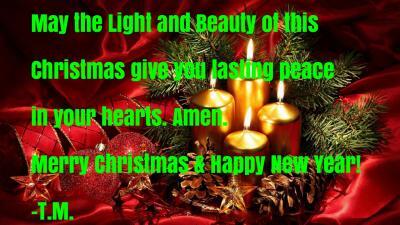 May the Light and beauty of this Christmas leave a lasting peace in your hearts. MERRY CHRISTMAS! AND HAVE A PROSPEROUS YEAR AHEAD! Don't hold too tight on your past mistakes or there would be no place for your brighter and more special Future. If you have dreams, never let go even if the rest fade, the one closest to your heart will still remain viable. Keep nurturing it. Keep watering it. Keep protecting it. You may want to give up sometimes, but keep doing these things and one day, your seed will begin to grow, you may not even be alive to eat its fruits but it will still grow regardless. Before LUCK, there was a hidden effort and dedication to such task. EXPECTATION says TOMORROW is a DECEPTION but HOPE says TOMORROW is a PRESUMPTION. Forgiveness is like promising someone never to use their mistakes against them anymore.